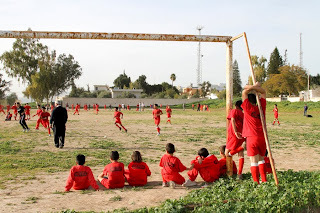 11 February 2010 – In the town of Sheikh Hussein, near the Israel-Jordan border, Kickabout dropped in on a program run by Mifalot, the Education and Social Project of Hapoel Tel Aviv FC. A much different experience than our visits with Right To Play, we spent less time playing and got a chance to observe Mifalot’s program in action. Mifalot encourages children to participate in after-school education programs with football being the hook. If the kids want to play and be a part of a “Hapoel Tel Aviv” team, they are required to fulfill the education requirements of the Mifalot program. They use football as an incentive to learn, and here in Jordan, the focus is on learning English and making positive lifestyle choices. Now, instead of making trouble after school, Mifalot provides kids an outlet that is both physically and mentally constructive. You could feel the passion and excitement for what Mifalot is doing here. 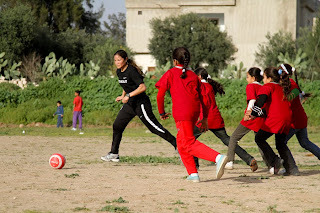 When we walked into an English class, everyone jumped up and yelled, “Welcome to Jordan!” While we did not run a clinic or do much coaching, Lorrie jumped on the pitch and wowed the boys with her skill. Several boys said they had never seen such a good female footballer. As she often does, Lorrie turned her enthusiasm towards the girls on the sideline and got them to join in the fun. It was very cool to see the girls step out and get stuck in. 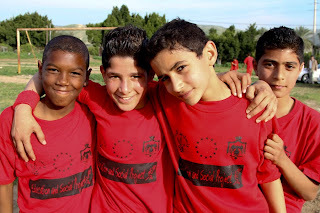 Mifalot is the largest sport for development project in the Middle East, with over 300 program sites throughout Israel, Palestine, and for the first time, Jordan. Local Mifalot Coordinators, Abu El Majed and Yehonathan Stein, gave us a tour of the area and explained why an Israeli football club wanted to open a project in Jordan. 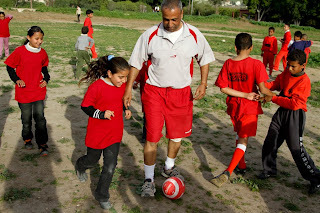 “Mifalot and Hapoel want to provide quality education and sport activities to all children, no matter where they live. And here in Sheik Hussein and Shuna, most of the families here are farmers and there is not much to do after school gets out in the early afternoon,” said Yehonathan. In addition to Mifalot’s work in Jordan, they have hundreds of programs in the Middle East. Visit the Mifalot website to learn more about their incredible work. 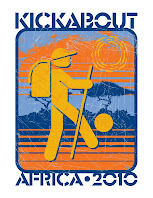 3 comments: on "Kickabout: Mifalot in Jordan"